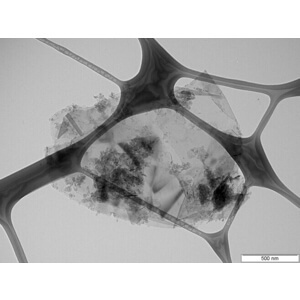 Our F Functionalized Graphene Nanoplatelets are useful as nanoscale additives for advanced composites, as a component in advanced batteries and ultra/super capacitors, as the conductive component in specialty coatings or adhesives, and as a component of e-inks or printable electronic circuits. Secondary reactions involving substituting the Fluorine atom from the sidewall have been utilized to produce C-N bond formation, free radical addition, and cycloaddition. 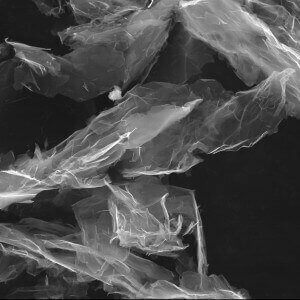 Our F Functionalized Graphene Nanoplatelets consist of small stacks of graphene that can replace carbon fiber, carbon nanotubes, nano-clays, or other compounds in many composite applications. When added in trace amounts to plastics or resins, our graphene nanoplatelets make these materials electrically or thermally conductive and less permeable to gasses, while simultaneously improving mechanical properties like strength, stiffness, or surface toughness. They are useful as nanoscale additives for advanced composites, as a component in advanced batteries and ultra/super capacitors, as the conductive component in specialty coatings or adhesives, and as a component of e-inks or printable electronic circuits. Other applications include exceptionally strong and impermeable packaging, better lubricants, and a recent publication even demonstrates that our conductive graphene nano-platelets, surface-treated with sensitized molecules, can be used to produce highly sensitive bio-sensors. The introduction of nitrogen containing functional groups onto the N2 Functionalized Graphene Nanoplatelets surface is known to promote faradaic pseudocapacitive reactions. Among these functional groups pyridinic and pyrrolic enhance the capacitive behavior, while quaternary nitrogen and pyridinic-N-oxide improves electron transfer.